A massive 1960s spill has Californians on edge about Trump’s push for oil extraction. On January 28, 1969, a blowout from Union Oil’s Platform A spilled more than 3.2 million gallons of oil into the Santa Barbara Channel. The disaster was a seminal event that helped create the modern environmental movement, and it forever changed the political and legal landscape for offshore oil development in California. No new oil leases have been approved off the California coast since 1984. Today a large majority of Californians believe that offshore oil development is not worth the risk. Opposition stands at 69 percent, including a majority of coastal Republicans. Based on my research, and years of experience working with passionate Californians as the executive director of the California Coastal Commission, I expect that there will be a long and protracted fight before any new oil development is authorized here. The first offshore oil wells were drilled in 1896 from wooden piers in Summerland, California. By 1906, some 400 wells had been drilled. The first true open-water well was drilled in 1938 in the Gulf of Mexico. In that same year, California created the State Lands Commission to better regulate leasing and production of offshore oil. As new technology enabled drilling in deeper waters, the commission began leasing tidelands near Huntington Beach and off of Ventura and Santa Barbara counties. Early on, ownership of tidelands was unclear. In 1953 Congress gave states control over tidelands within 3 miles of shore and placed the Outer Continental Shelf (OCS) — submerged lands beyond 3 miles — in federal hands. The Santa Barbara blowout lasted for days, spreading oil over hundreds of square miles and tarring more than 30 miles of beach. Thousands of birds, marine mammals and other seas creatures were killed. As the spill unfolded on national television, the State Lands Commission imposed a moratorium on offshore drilling. The Interior Department also suspended federal activities, but following a regulatory review the Nixon administration tried to accelerate OCS oil development, especially when the 1973 OPEC oil embargo highlighted U.S. dependence on Middle East oil. Congress, meanwhile, was passing keystone environmental laws, including the National Environmental Policy Act; major amendments to the Clean Air Act and Clean Water Act; the Coastal Zone Management Act; the Marine Mammal Protection Act; the Ocean Dumping Act; and the Endangered Species Act. Californians passed the coastal protection initiative in 1972, and the legislature enacted the Coastal Act in 1976, creating a commission to regulate development in the coastal zone. Nascent environmental groups now had new legal tools to take on polluting industries, including oil companies. Between 1972 and 1978, six lawsuits were filed against OCS lease sales, stymying federal efforts to increase offshore production. Legal challenges to OCS leasing motivated Congress to reform the offshore oil program. In 1978 Congress amended the Outer Continental Shelf Lands Act, calling for “expeditious” development but also creating a phased decision process for planning, leasing, exploration and production. The law required comprehensive social, economic and environmental analysis, and provided opportunities for states to participate. Its supporters hoped that the new “rational” process would lead to accelerated, yet environmentally sound OCS oil development. The new law didn’t work. Beyond the Gulf of Mexico, where thousands of oil platforms were already operating, conflicts only worsened. Between 1978 and 1990 the Coastal Commission, other coastal states and environmental groups filed 19 lawsuits challenging the OCS leasing program. Californians were particularly incensed in 1981, when the new Interior Secretary James Watt reversed a prior decision against leasing offshore of central and northern California. This decision triggered an explosion of litigation and protests. In one lawsuit the Coastal Commission argued that OCS leases directly affected the state’s coastal zone, and therefore should be reviewed by the commission. The Supreme Court disagreed in 1984, but eventually Congress changed the law to agree with the commission. Thousands of citizens protested at another lease sale hearing in Fort Bragg. Fifteen cities and counties from San Diego to Humboldt adopted ordinances that restricted siting of any onshore infrastructure for offshore oil. Ultimately, 19 more platforms were approved off the California coast, mostly in the Santa Barbara Channel. But progress was slow, and the OCS leasing program began to unravel. Spurred by Watt’s aggressive approach, Congress started attaching leasing moratoria to appropriations bills. Between 1981 and 1994, these provisions expanded from protecting 0.7 million acres off California to 460 million acres off the Pacific and Atlantic coasts, the eastern Gulf of Mexico and the Bering Sea. In 1990, perhaps in an effort to get Congress to release other waters for exploration, President George H. W. Bush removed most federal waters off the Pacific coast, Florida and New England from the leasing program through 2000. President Bill Clinton later extended these moratoria through 2012, and in late 2016 President Barack Obama removed California from the federal leasing program until 2022. Environmental groups and the state had seemingly prevailed. 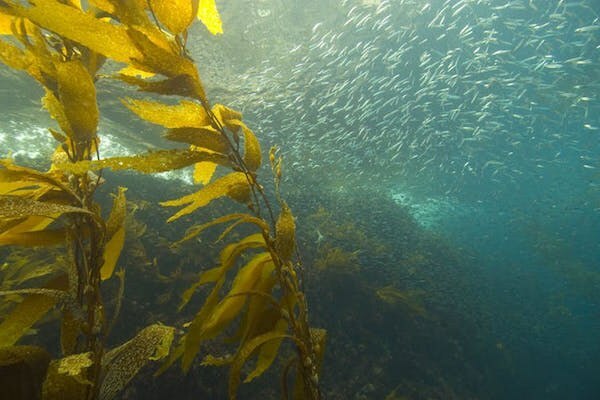 Kelp and sardines in the Channel Islands National Marine Sanctuary. The Trump administration’s reversal of past policy has already sparked tremendous opposition in California. Nearly all other coastal states also are objecting. In my view, offshore oil production in California now makes little sense. The U.S. no longer faces an oil crisis. Domestic production is at record levels, and California is actively working to reduce greenhouse gas emissions to fight climate change, including through renewable energy development. Though California is still the nation’s third-highest oil producer, there is strong political and public support for a forward-looking energy portfolio, rather than expanding offshore oil development — especially given its threat to the coast. For Californians who want to pursue a progressive energy policy, more can be done at the state level. One pending bill would prohibit new pipelines in state waters to support new OCS production. The Coastal Act also could be amended to replace its outdated 1970s-era policy, which makes allowances for offshore production, with a policy stating that offshore oil and gas development is no longer in the state interest — except, perhaps, in a national security emergency. Renewable sources such as wind and wave energy could be supported instead. Such actions would be symbolically important now, and could help California make headway towards what many protesters here are calling for: a permanent ban on offshore oil development. Charles Lester is a researcher at the Institute of Marine Sciences, University of California, Santa Cruz.